OK - I know this is tacky and none of us like being "outed". But, I can not help but wonder - looking at Nancy Pelosi on different days - how some days her hair looks like it is thinning especially the part of her hair. And then today - essentially the part was minuscule. Then I started my "wig detection" process and between the hear and the top of her head, it looked as though it might be a wig. A darn good one I should add. I am sure human hair and specially tailored custom made. But - I think so. Now that I am a full time wig wearer - I find it interesting when I "suspect" a wig. It is interesting to see just how good they can look. If it were not for the comparison to other days - I would never suspect. I do believe that almost everyone in the public eye - women in particular - may well be wearing hair. I never though of a politician - although I always thought Hillary sometimes would supplement with a wig. Interesting! I've definitely noticed when she has changed her styles, going from a shorter bob to a longer look, but I haven't looked that closely. Sounds like we'll have plenty of opportunity to be doing that in the days to come! Indeed. I am always amazed by how fit she is and looks. I was actually trying to decide whether what she was wearing might be a topper or a wig. Who knows - perhaps it is her bio hair after having it just done. Yep - plenty of on air time for all of our politicians. It is a sad state of affairs no matter what your politics are. It's funny, I was watching her on TV and mentioned to my husband if he thought her hair looked different, darker and a little fuller......I know for sure, if my job involved anything to do with TV, I would have started wearing hair way before last summer! Wigs are a blessing to us hair challenged women. frankly - i cannot understand anyone in public life not wearing one. It would be kind of fun to try to do wig spotting on celebrities and politicians. As a wig person my eye definitely looks. Curious about all of the people with perfect hair always. Like meghan markle or kate. But i dont spot a wig in either. Wig wearers are usually pretty savvy about spotting a wig on others, I have noticed..
Haha! Yes, Nancy looks great (no matter what you think on the politics ;) I’ve been on wig detection since I started wearing them. I believe at least some of the ladies on the news and news programs wear alternative hair! Toppers at the least! I actually looked closely at Nancy's hairline yesterday and it looked pretty natural. 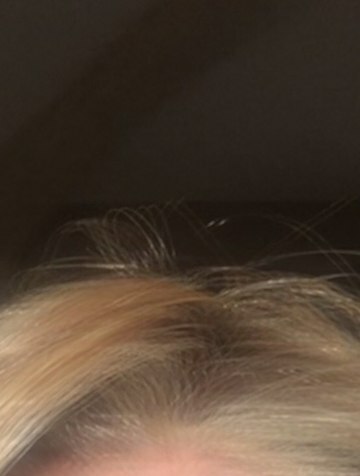 You could see baby hairs and the part also looked fairly real. So it is either her real hair or a pretty high-end wig. It must be so difficult for women in the public eye...everything has to look perfect so much of the time. I think that many of the TV ladies have extensions, which can serve as thickeners if you don't have a sparse spot to cover up on top. That's a more expensive option than most of us have. I think her hair varies in thickness which is what caught my eye. Considering her net worth - i am certain any enhancements are quite custom. I am attaching a pic of my raquel welsh hairline - not custom - and i think it is undetectable except up very close in a certain light. What drew my attention was that a prior day her part looked wide and showed thinning and the next day the part was unnoticeabje and her hair looked fuller. Along the sides, it looked like her hair was a natural hairline that got suddenly fuller. It could just be makeup or styling products. No judgements. I actually find it encouraging that - if it is a wig - it looks so natural. Wigs dont need to look like costumes any more. Your hairline is impeccable - no one could tell. raquel welsh does a great lace front. I am sure custom is great too. Yes, I think she wears extensions and have noticed the varying thickness of her hair. It must be difficult to have to look perfect for the camera while doing your job. I love Raquel Welch wigs and think they are underrated on many sites. I don't know for sure about Nancy but I can assure you that MANY/MOST people in the public eye, especially at a national level are wearing either wigs or pieces - at least some of the time. It's simply too hectic of a pace to keep up with hair on a day-to-day basis and still look good. I have worn wigs for years, in my private life as well as when entertaining and even with my 'superior wig-detection radar super-powers' turned on, I have still been fooled! Curious - are you in an over 55 community in Malibu? Other than Laguna Woods which is farther south - we have not seen than many over 55 communities in a nice temperate climate. Many of the communities seem to be far enough inland that they are very hot in the summer. Sorry to be off topic - but we are considering a move to a temperate climate that is nice year round. I've always thought that Nancy wore a wig. Unlike you though, I think it always looks off and wiggy. lately - my wig-dar is way up for some reason. Monica Crowley -definitely enhancements for sure:). No one has long hair that thick. I never used to notice. I actually think we do not have any journalists any more. I agree - the way they dress is so very weird - evening wear typically. I cannot imagine ever wearing that stuff to work - when I used to work. They are all attention seeking, ratings grabbers, opinion giving, smirkers, etc. It is a real shame. 24 hour news - we do not need it and it has really destroyed any dialog that is rational. And EVERYTHING is political - not just the "news". Regardless of our particular views - I would think everyone has had enough of all of them. It is not healthy. But - back to Nancy. I have become more convinced that - some days at least - she wears either a wig or extensions. Well, at least Rachel Maddow is wearing her own hair! I do crack up when I see how much makeup they put on her -- it's more than I would wear for a formal event. Based on this, I think at least part of how dolled-up these "TV journalists" look is how the network wants them to look. Are you sure????? :) Short hair can be deceptive in a wig. Yes - the massive eye makeup - it would have been laughable 20 years ago - I think. Perhaps I am showing my age again. I am sure that the networks are competing for ratings. Talk about sexism - do we see the men showing off their legs or "cleavage" - not that it would enhance ratings if they did that. I do think the term journalist is not what it used to mean, unfortunately. Interesting thread and agree with everything you all said. Guess some of us are old school and have integrity. So tired of the ugliness of politics and media (aka journalism). I'm also looking for the elusive helper hair wearers in the media and have been intrigued with Nancy Pelosi's hair recently LOL. So my first post and this what I replied to? I love wearing my wigs after havings doubts I could pull it off without someone laughing at my efforts. Last winter was hair loss shock. (Friar tuck not good look) After hiding out most of winter bought my first topper in March 2018 but clips only pulled out more of my limited hair. July 2018 purchased my first wig and have never looked back. I love reading advice and recommendations from others. I am indeed fortunate to have this forum, Thank you ladies. I actually tried a topper at first but could not stand the clips. Also a lot more work than a wig. I love Rachel Maddow.....she is so smart and makes me laugh out loud everytime I watch her, the faces she makes. I do think her eyelashes are fake and the way she blinks makes me think they are too heavy....or could be her contacts.She wore a blue jackets one night and joked about the lighting in the closet made it look black, she always wears black. I really like Nicole Wallace's hair color, and I bet it is her real hair. I enjoy watching MSNBC as the women don't try to act like they are in the evenig wear part of a beauty contest. CNN is like that too. But really I have avoided the news as it is all so darn depressing. Ok - joni ernst???? Is she lucky enough to have hair that thick? She has a new hairstyle. I actually like the style but it “spoke” to me. I am a hairdresser and I think Nancy has very good genetics for thick hair. The reason her hair looks thicker than other times, in my opinion, is because her color is either freshly tinted (which always makes your hair look thicker) or has a slight grow-out which is mostly likely grey and makes your part look wider. I always pay attention to their hair! Rachel's hair is real. I can tell when she gets it trimmed. I think she hates the make-up she has to wear. If you see her anywhere outside of work, she is bare-faced. I’ve not thought of Nancy’s hair, but watching Martha Stewart this afternoon and I’m seeing the same problem I have with side bangs always falling forward. And come to think of it, Martha’s hairstyle hasn’t changed much over the years. I just googled Jeannie Seely to see a pic, she is 78, I wish I had hair like hers, especially at 78.....love the style.....wig? ?